It’s nice to boast of possessing something that few others in the world have. That’s the case with this compilation assembled by Maxx Klaxon, the artist remembered for a couple of appearances almost ten years ago (on POWERSLAVES by Holland’s Angelmaker and 666 VS. 808 from Spain’s Star Whores), with a cover of Iron Maiden’s “Die With Your Boots On”. Klaxon has decided that the time is ripe to reorganize his label, relaunching it as Popular Front Systems (formerly Popular Front Records) with a compilation dedicated to SPLICE, called SPLICEWERK, which is full of songs that demonstrate how the creative contributions of American musicians have never waned. 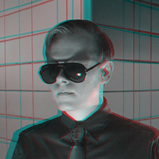 As lord of the manor here, Klaxon includes a couple of remixes of his previously released songs: “First We Take Manhattan”, retouched by Parenthesis, and “Die With Your Boots On”, transformed into a maelstrom of twisted and deformed beats by _vectorzero. SPLICEWERK is a collection that highlights the brilliant experiments that continue to fuel the endless avenues of electronic music. 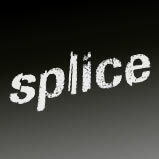 SPLICEWERK is available in CD and download formats, from CD Baby, Amazon, and iTunes. It’s a very 21st century construction, arguably because the ‘80s cold wave phenomenon never really was, not until compilations like this made it so, collating its existence from press snippets, collectors, or legend. The fictionalised past of their own design, the Brooklynites then romanticise for its vanished mystery, venerating its scarcity, its stillness, even its deadness, in a perpetual-motion world where such traits have been relegated to history by the internet. Predictably, of utmost importance is the semi-mythic context to the music, perfectly visualised by the bleary photos of French youth, pictured in misty villages and monochromatic rural suburbia. Onwards now to the inevitable anti-climax. … Without the coruscating likes of Martial Canterel, whose material is a beacon for the artists flocking to Brooklyn’s Home Sweet Home week-on-week, the more radical and thrilling soul of the demimonde has been culled. A fairly useful exposition of cold wave Synthwave 10 may be, but after prolonged exposure to the commercial end of the scene, the square beats, dirty filters and step-sequencers become oppressive and eventually rote. After one listen, the practiced dispassion evolves into joylessness, and the chill is numbing. I like a lot of minimal wave/coldwave, but Calvert has a point (notwithstanding the fact that he mistakenly places the Wierd Records weekly in Brooklyn — it’s actually on the LES). So is it time for someone to start — or retrospectively curate into existence — “maximal wave”?